Doncaster's former Posh boss Grant McCann has led his current team back above his old team. Peterborough United dropped out of the League One play-off zone thanks to an impressive 4-1 win for Grant McCann’s Doncaster Rovers over Bristol Rovers last night (March 26). Doncaster are now sixth - the final play-off slot - two points ahead of Posh and both teams have seven games to go. Doncaster also boast a much better goal difference. 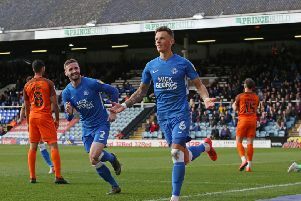 McCann’s men could pull five points clear of Posh on Saturday (March 30) as they host struggling Walsall, while Posh have no fixture. Blackpool (home to Plymouth) and Coventry (away to Barnsley) could also overtake Posh at the weekend. Posh return to action at home to Gillingham on Saturday, April 6. Unsurprisingly there were no Posh players selected in the League One team-of-the-year, the team chosen by fellow professionals. Current top two Luton and Barnsley supply three players each. Barnsley boss Daniel Stendel was nominated to manage the side. The team selected was: Adam Davies (Barnsley), Jack Stacey (Luton), James Justin (Luton), Matt Clarke (Portsmouth), Ethan Pinnock (Barnsley), Alex Mowatt (Barnsley), Herbie Kane (Doncaster), Cameron McGeehan (Barnsley), Aiden McGready (Sunderland), James Collins (Luton), John Marquis (Doncaster).